Official launch of eChannelling for Government Hospitals at eHospital-Dompe by Minister of Telecommunication, Digital Infrastructure and Foreign Employment Hon. Harin Fernando. Also present were (from left) Chairman Sri Lanka Telecom & Mobitel Mr. P G Kumarasinghe Sirisena, Chairman ICTA Sri Lanka Prof. Rohan Samarajeewa, Member of Parliament/Chief Organizer (Dompe), United National Party Hon. Harshana Rajakaruna, Regional Director of Health Services Gampaha Dr. Nalin Ariyarathne, Medical Officer in charge of ‘e-Hospital Dompe’ Project,‘eChannelling’/Provincial Coordinator of ‘e-Hospital’ Project Western Province/Consultant (Digital Health & Change Management) ICTA Sri Lanka Dr. K B Sampath Kulathilaka and Chief Executive Officer ICTA Mr. Dhamith Hettihewa. 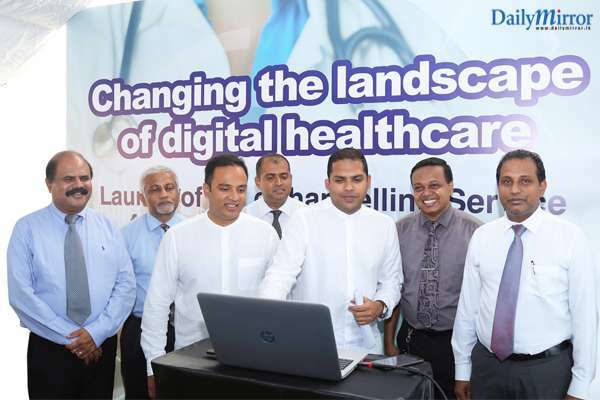 eChannelling PLC, the largest Doctor Channeling Network in Sri Lanka, along with Mobitel, and the Information and Communication Technology Agency of Sri Lanka (ICTA) have embarked on a national endeavour – “eChannelling for Government Hospitals” - as a service provider for OPD time reservation at government hospitals. This project is carried out under the guidance of the Ministry of Health, Ministry of Telecommunication and Digital Infrastructure and Foreign Employment, and ICTA to build a healthier nation by upgrading the existing health care system in Sri Lanka and enhancing its position in global rankings. This historic partnership will vastly facilitate smooth access to medical care for government hospital patients. eChannelling believes this service will enhance convenience for government hospital patients and save time and energy spent waiting in queues. Patients can make OPD time reservation via 0715 225 225 from any network without waiting in queues for OPD treatment in government hospitals, thanks to eChannelling’s digital platform. The service is offered free-of-charge. The time reservation facility has been extended to the internet (www.echannelling.com) and smartphones (eChannelling App), boasting the latest technology for further convenience of users. This service offers greater convenience for hospitals as they are able to enable modern healthcare facilities through technology to the general public free-of-charge. This would also help hospitals to better utilize physical infrastructure and human resources more effectively and efficiently. This service also greatly benefits patients as it saves them time otherwise spent waiting at the OPD for hours, and keeps the hospital informed in advance about their service requirements. The facility will be launched island wide in the future as a national endeavor to revolutionize the health care sector and build a healthy nation. Boasting a network of 200+ recognized hospitals, more than 5500+Doctors, over 2000+ outlets and coverage of any telecommunication network, eChannelling is the easiest way to channel a Doctor dial 225 from anywhere at any time. Mobitel, the National Mobile Service Provider, has taken digital healthcare to the next level by including eChannelling PLC into its portfolio and strengthening its vital position in the telecommunications industry in the country.